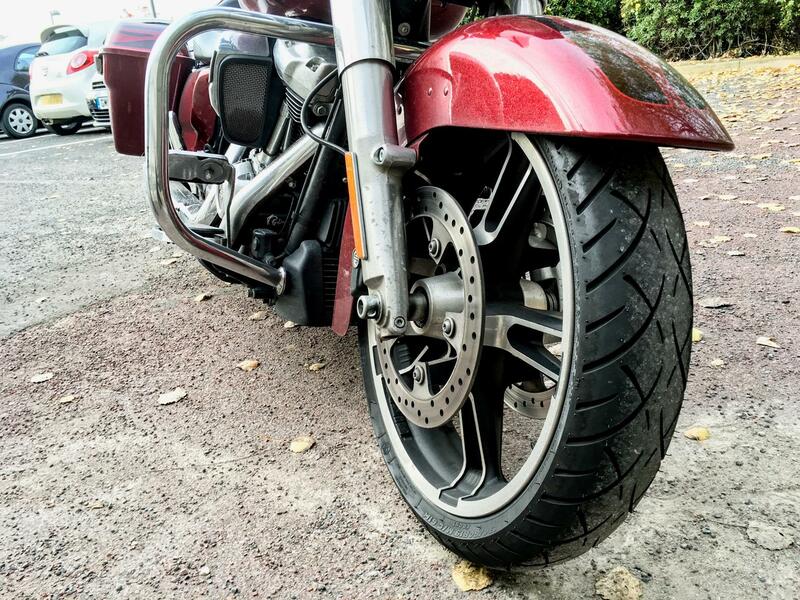 One of my big criticisms about the Street Glide was the tyres. In the dry they were fine and if I wanted to do thousands of miles, I’m sure they’d have managed it but in the rain they were pants. The torque of that big twin meant that once it started spitting, the rear tyre would light up at a mere hint of throttle. It was never particularly scary, as the long and low style meant the whole thing slithered back together quite easily, but it wasn’t pleasant at the best of times. So in the fading light of my long term test, I snuck on a pair of Metzeler ME-888s and what a difference they made. A lot of my miles are spent on the motorway, hurtling to Peterborough and back on the M11, but the journey is bookended by a few miles of twisty tarmac that are peppered by a Harley owner’s worst nightmare: roundabouts. In the rain the OE tyres made these white devils harder than they need to be but the Metzelers eliminated that instantly. Even at low speeds, the whole bike was much more composed in the wet with the ME-888s and you could whack the throttle open without fear of a highside outside Morrisons. As I wound the speed up the Street Glide had a much lower tendency to start drifting around and generally had a more confidence inspiring ride. In the dry the ME888s didn’t feel that different to the OE tyres, but they were certainly no worse. Unfortunately I only logged about 1500 miles on the ME888s before the Glide went back to Harley, so I can’t really comment on how long they lasted other than to say they showed no signs of squaring off. Absolutely. For around £330 a set (depending on size/fitment) it’s one of the best upgrades you can make to these bikes.